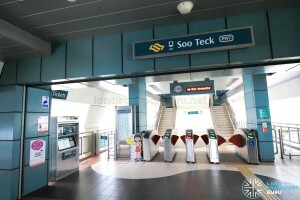 Soo Teck LRT Station (PW7) is a light rail station along the Punggol LRT (PGLRT)’s West Loop. 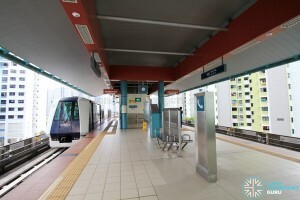 Located within the Punggol New Town, the station is overground and built along Punggol Way, between the junctions of Punggol Central and Punggol Field. The station is named after a former primary school which was situated in the vicinity. 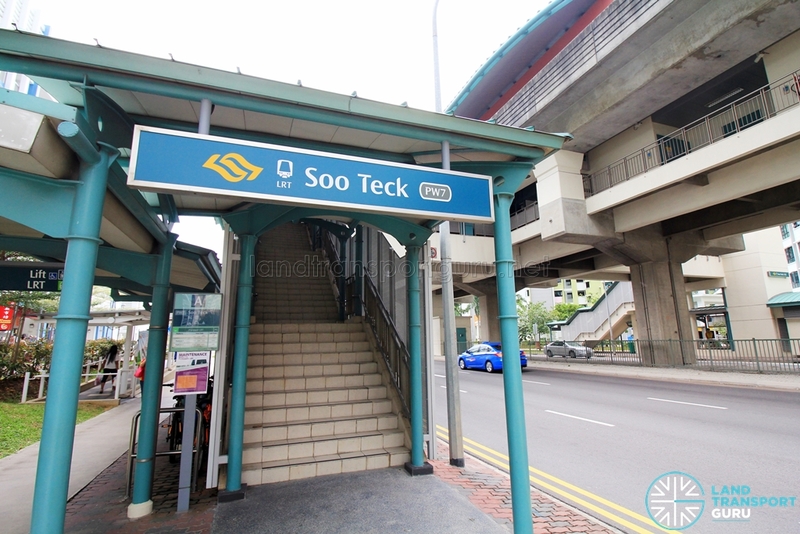 Soo Teck station is overground with an island platform serving LRT services in both directions of the West Loop. Inner and Outer loop services run counter-clockwise and clockwise around the loop respectively. Passenger Information Systems, which are LED displays located at each platform, display the route of the next train and scrolls through messages, while an analog clock gives the time. Tactile flooring helps to guide the visually-handicapped from the platform to the station exits. A staircase and lift connect the platforms to the ticket concourse at Level 2, one floor below. The station concourse at Level 2 features faregates for automatic fare collection and provides access between paid and unpaid areas of the station, with a bidirectional wide-swinging gate for the benefit of passengers-in-wheelchairs and those carrying bulky items or travelling with prams. A General Ticketing Machine at the concourse allow commuters to purchase tickets for single or multiple journeys, and perform contactless card transactions. As with other PGLRT stations, the concourse has two ticketing machines: one located within unpaid areas and the other serving both paid and unpaid areas, with a swing gate that allows either side to access the machine at any one time. Since the station is not staffed, an intercom system near the faregates allows commuters to speak with PGLRT Operations Control Centre for assistance. 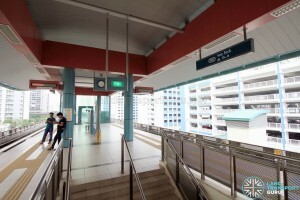 The concourse leads to an overhead bridge that spans across Punggol Way, with lifts, escalators and stairs connecting to street level. Built in-between two carriageways of Punggol Way, Soo Teck LRT station has an exit on each side of the road. Barrier-free accessibility is offered via lifts. Emergency Train Stop buttons at station platforms, when activated, will prevent approaching trains from entering the station, and any train already stopped at the platform will be prevented from moving off. 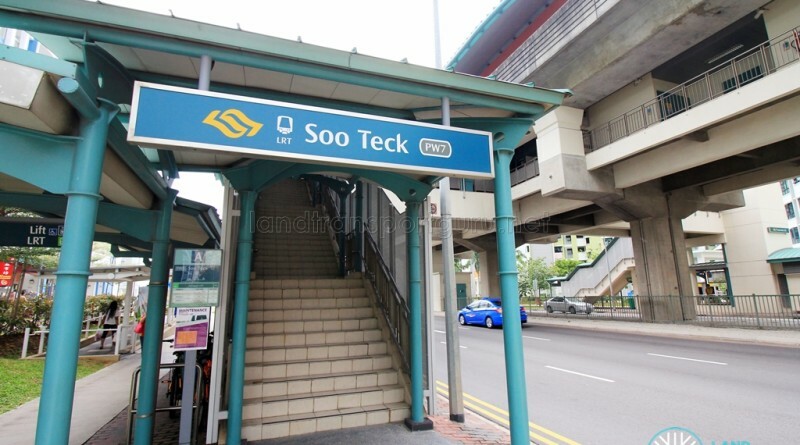 Soo Teck station connects to two bus stops in the vicinity. Bus stops near LRT stations are not numbered. There are no bridging services for West Loop Inner. Free regular bus services may be offered at bus stops connected to LRT stations. 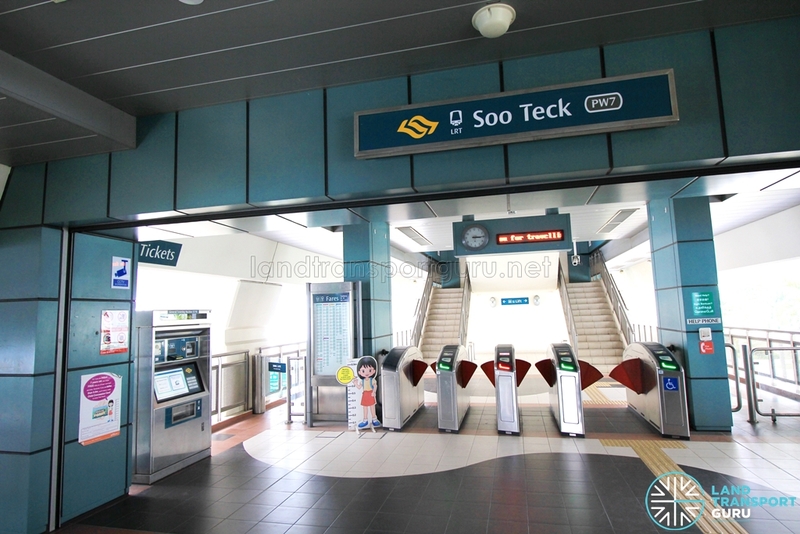 Soo Teck station opened on 29 June 2014 along with train services on the Punggol LRT West Loop.